The visiting Benetton side were forced to undergo a rushed warm-up after the team bus was in a minor crash before the game. A LATE ANDREW Trimble try spared Ulster’s blushes as they scraped by Benetton at Kingspan Stadium, winning their Guinness PRO14 clash 23-22. Trimble struck two minutes from the end to break Italian hearts, with Tommaso Allan’s impressive kicking display not enough to see them over the line as the hosts struck at the death on a cold night in Belfast. There was drama before the game even started, however, as the Benetton team bus was involved in a minor crash which delayed kick-off by ten minutes and meant the Italians were forced to undergo a hastily prepared warm-up. Not that it impacted them in any way as the visitors started with aplomb, taking the lead through a fifth minute penalty from Italian fly-half Allan, although they could have easily scored a try thanks to their forward dominance. 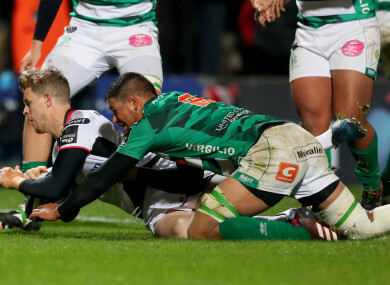 Allan was on hand to make it two in the 12th minute as Kingspan Stadium sat back in stunned silence as the visitors controlled the opening exchanges. Indeed, it took Ulster nearly 20 minutes to even threaten, and when they did they were lethal, John Cooney breaking off the back of a maul and feeding Tommy Bowe at the perfect moment, allowing the winger to outpace his opponent and score in the corner. That seemed to spark them into action and Cooney extended their lead with his first penalty of the game in the 22nd minute, however he pulled another wide a few minutes later. The hosts got a boost when Benetton winger Andrea Bronzini was yellow carded for a hit on Louis Ludik off the ball, but it was the visitors who were the dominant side with one less man and after he missed one kick at goal, Allan struck over a third penalty to reduce the gap to four at the break. After the break, with Bronzini back on the pitch, Benetton went from strength to strength and Allan brought them back to within a point with another penalty before they finally, deservedly, went ahead. Paul Marshall, on for his 200th Ulster appearance, sent up a box kick that didn’t go far enough, and even though Schalk van der Merwe recovered the ball his pass went straight to Robert Barbieri who ran it back in for the try. Despite Christian Leali’ifano taking over kicking duties with Cooney off the pitch and bringing it back to one point with a penalty, it was still the visitors dictating play as they looked to kill the game off. Both Luca Sperandio and Marty Banks tried kicks in behind that nearly paid off, however they had to settle for a Banks penalty to take their lead back up to six with seven minutes to play. In the end that wasn’t to prove enough as Ulster went up the other end and stole the win, arguably undeservedly. Darren Cave carried off first phase ball and, after setting it up, Andrew Trimble took the ball and crashed over at pace for the game winning score after Leali’ifano added the simple conversion. It sent the home crowd home happy after a freezing night on the Kingspan terraces, but it left a whole lot to be desired. ULSTER: 15. Charles Piutau, 14. Tommy Bowe (Andrew Trimble 74), 13. Louis Ludik, 12. Christian 11. Leali’ifano, 10. Craig Gilroy, 9. Peter Nelson (Darren Cave 53), 1. John Cooney (Paul Marshall 53); 1. Callum Black (Schalk van der Merwe 45), 2. John Andrew (Rob Herring 52), 3. Ross Kane (Andy Warwick 52), 4. Kieran Treadwell, 5. Alan O’Connor, 6. Clive Ross (Greg Jones 34), 7. Aaron Hall (Matthew Dalton 70), 8. Nick Timoney. BENETTON: 15. Luca Sperandio, 14. Tommaso Benvenuti, 13. Ignacio Brex, 12. Alberto Sgarbi, 11. Andrea Bronzini (Marty Banks 56), 10. Tommaso Allan (Luca Morisi 64), 9. Giorgio Bronzini; 1. Cherif Traoré (Nicola Quaglio 65), 2. Tomás Baravalle (Hame Faiva 56), 3. Giuseppe di Stefano (Alberto de Marchi 40), 4. Alessandro Zanni, 5. Irné Herbst (Federico Ruzza 53), 6. Whetu Douglas, 7. Nasi Manu, 8. Robert Barbieri (Marco Barbini 67). Replacements not used: Luca Crosato. Email “Late Trimble try rescues unconvincing Ulster from Italian heartbreak ”. Feedback on “Late Trimble try rescues unconvincing Ulster from Italian heartbreak ”.